Bicycle riding is more than a pastime taught to and enjoyed by young children. It is a useful form of physical activity that encourages routine exercise and contributes in the fight against obesity. Often, children who learn to ride a bike will continue to do so as adults, as it is a skill that is not easily forgotten. For adults, a bicycle not only serves as a form of recreation and relaxation, but it also may serve other more practical purposes as well. People who are just beginning to use their bicycles for travel other than a weekend spin around the park can best appreciate it by researching various ways that bikes can be used for travel and by fully understanding the rules of use. Commuting by bicycle is an environmentally friendly choice for many professionals across the country. A bicycle is a reliable alternative to cars during one’s daily commute that has numerous benefits in terms of the environment and human health. For the environment, bicycling to and from work reduces the number of cars on the road and as a result reduces the amount of pollution that is being released into the air. Because bicycling is a manual activity, there’s no consumption of fuel, which is also beneficial in terms of saving money. Bicycling also helps relieve some of the congestion that often clogs up roads during the busy commuting hours. In regard to human health, bicycling is a great way to work in regular exercise. This form of commuting isn’t possible for everyone, however. People should check with their health care provider before leaving their cars at home in favor of their bicycles for the daily commute. The distance to and from work should also be considered as well as one’s current physical health. People who are not accustomed to riding their bicycles routinely may choose to bike to work for part of the work week and either drive or take public transit for the remainder of the week. Preparing to commute also includes wearing the correct gear and clothing and changing into fresh clothes at work. 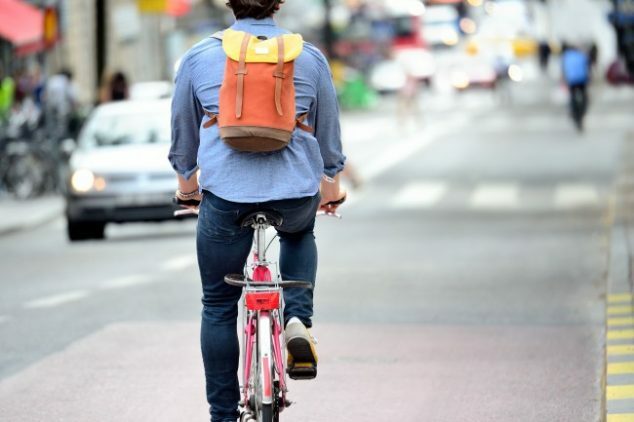 Employees who bike to work will also want to check with their employers to see if they provide the Bicycle Commuter Benefit, which is a federally authorized tax-free reimbursement. A bike tour is a trip in which a solo bicyclist or several bicyclists travel entirely by bicycle for the pleasure of enjoying nature, the company of others, or quiet time alone. It is a type of physically active trip that is good for both body and mind. These trips can be arranged with a bicycle touring company or can be self-planned. These tours can be as short as a few days or even months or longer. They involve traveling long distances, even across a country or from one country to the next. Tours may be arranged as a solo trip, or some people may choose to go through a touring outfitter. There are several touring methods that affect how bicyclists travel during their trip. It is important to choose the correct method for the greatest comfort of the group. When a bicyclist carries very little gear and clothing on their person, it is called lightly loaded touring or credit card touring. With this method, the bicyclist purchases meals along the way as opposed to carrying food and cooking equipment. In addition, people who tour via the credit card method also stay in motels or other lodging along their route. On the opposite end is the fully loaded or self-supported touring method. Bicyclists carry all of their needs on their bicycles, from cooking equipment to shelter to tools. This significantly weighs down the bicycle, which can at times weigh more than a hundred pounds. Ultralight touring involves traveling with light gear that won’t weigh as much or take up as much space at the campsite. Prior to embarking on a long-distance bike ride, people must properly prepare, even those who routinely ride their bikes for recreational purposes. A long-distance ride is a true test of endurance that is affected by the touring method chosen. Interval training, in which bicyclists ride their bikes hard for a set amount of time, such as three minutes, followed by three minutes of rest, is suggested. This type of training should be done as many as three times a week for no less than 30 minutes. When not working in the timed interval sessions, people should gradually increase the amount of time spent on their bikes so that they are riding their bikes for as much as three-quarters of the planned length of their long ride. Lunges, squats, and other exercises for resistance strength training are also recommended. This can be done every other day and should include the use of free weights. Resistance strength training helps to build muscle and improves endurance. Working recovery days into the week is also an important part of training, as it helps prevent injury and allows for muscle repair. Bicycling laws and safety guidelines are designed for the safety of bicyclists and those around them. They must be adhered to every time the cyclist takes their bike on the road. In practicing good bicycling safety habits, the rider should ensure that the bike is road-ready and safe. To do that, the tires must be checked for proper inflation and signs of worn rubber or wear. Brakes and gears should be tested before riding and the seat and handlebars positioned at the appropriate height for the rider. Helmets are a crucial part of safety when riding a bike. They must be sized appropriately so that they fit on the head securely and properly. Additionally, they must be worn every time the rider is on their bike. In general, bicyclists must know and follow the rules of the road, such as stopping at stop signs and red lights. Clothing should be lightweight and bright in color for the best visibility. In terms of fit, it should be neither too loose or so tight that it restricts movement. While safety guidelines tend to be universal, laws differ from state to state. This is important for people who have recently moved into a new state or for touring cyclists who are traveling across country or outside of their home state. Biking is a healthy pursuit, has low environmental impact, and is a fantastic way to see the country. Many states and municipalities offer amenities specifically for the cycling enthusiast. While there are innumerable locations in which to enjoy cycling, many cities offer unique opportunities for the cyclist. Some of the top biking destinations in the United States are found from coast to coast. Below are just some of the top biking destinations to enjoy across the country. Despite the high altitude, Boulder offers picturesque views and bike paths covering hundreds of miles. Bike-sharing programs and mountain biking trails make Boulder a sought-after destination for cyclists. The great outdoors and burgeoning cultural scene offer a variety of activities when you’re not on the trails. New York City’s traffic may be a challenge to overcome for the cyclist used to more rural settings, but traveling through congested areas is made easier when leaving the car behind and traveling by bike. There are many hundreds of miles of dedicated bike lines, and the Hudson River Greenway is an 11-mile pedestrian stretch for recreational use including biking. New bike-share programs allow for New Yorkers and tourists without their own set of wheels to enjoy the Big Apple on two wheels. Minneapolis is a huge biking town boasting the second largest number of bicycle commuters in United States metros. There are more than 100 miles of bike-accessible pathways and some beautiful and easy-to-maneuver flat trails. The sought-after culture and hip nightlife are big draws for the cycling community. Bike-sharing is a growing trend in Minneapolis as well. When the weather’s right, get out and bike! No list of bike- and cycling-friendly cities can exclude Austin. There’s a six-mile bikeway dedicated to the sport and enjoyment of cyclists running through the very heart of the city. Austin boasts a bike zoo that allows cyclists to maneuver through a menagerie of colorful giant bike creatures. It even includes a bicycle carousel. The Texas capital offers cultural and historical tours and attractions that can keep the cycling tourist busy when not on the road. The granddaddy cycling city in the United States, Portland, has more cyclists per capita than any other. It has been the inspiration for cities to open its byways to bikes and cyclists of all skill levels. Some of the best bike shops in the country can be found in this quirky and beautiful metro. If you want to take a break from Portland’s urban scene, Portland offers single-track mountain bike trails in Forest Park, the United States’ largest urban preserve. The food scene in Portland offers some amazing and luscious treats, and biking this fantastic city is a great way to burn off the calories of a night on the town.